Credit cards can be very useful tools, however, if you are burdened by a portion of the $850 billion that Americans are currently carrying in credit card debt, chances are, you're looking for a solution. One way to improve your cash flow is to consolidate credit card debt. You can put together your own debt consolidation plan and save the money you would pay to a company for its services. A DIY plan to pay off credit card debt can involve transferring balances, applying for a debt consolidation loan or a home equity line of credit, even securing a personal loan through a social lending network. No matter which direction you choose, it's best to look before you leap. Carefully investigate your options before signing up to borrow money. The overall goal when consolidating credit card debt is to lower your monthly payments and the amount of interest paid on all your cards. 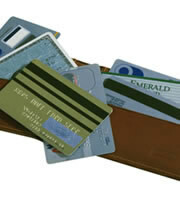 Look for no- or low-interest credit cards that can be used to consolidate debt. Many issuers offer a 0 percent interest rate for a period of months that can provide you time to make headway on your balance. Though there are occasional exceptions, there is usually a fee that accompanies balance transfers. Make sure that you know how much the fee will be and compared to what you'll save in interest. Read through the credit card terms to get information about fees, payment deadlines and other features. The terms should also explain the default rate if you are late with a payment. If you don't want to apply for new credit lines, consider comparing credit card offers from existing accounts that allow balance transfers at low teaser rates. Having a higher credit score may make it easier to qualify for the most competitive balance-transfer offers. Conversely, it may be more difficult to qualify for a balance transfer credit card if you have been late with payments or have gone over your credit limit. Check out the company's reputation. Your state attorney general's office or the Better Business Bureau should have a record of any complaints. Ask for referrals. People you know may be able to refer you to some debt consolidation firms that have successfully helped them pay off debt. Understand the fees and terms. Get all the fees and terms for service in writing before signing up. The service may require you to deposit money into an account each month that goes toward paying off debt. Avoid high-pressure tactics. Avoid debt consolidation companies that engage in high-pressure sales tactics or ask for fees up front. Keep in mind that consolidating credit card debt may take some time to accomplish, but lower monthly payments and improved cash flow can be well worth the effort in the long run. 0 Responses to "How to consolidate credit card debt like a pro"